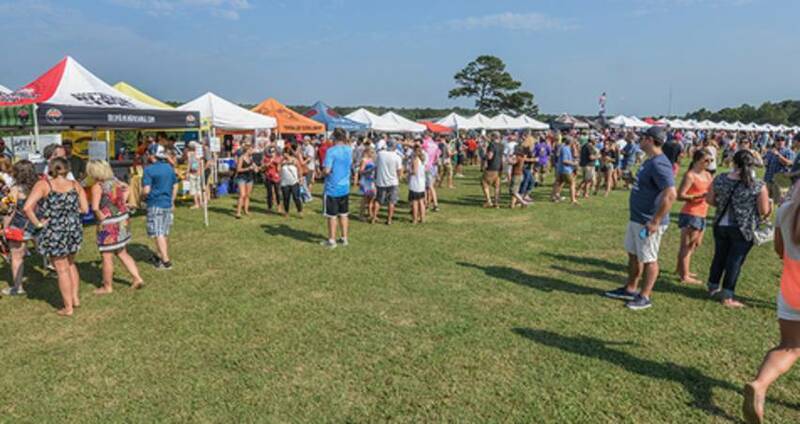 Enjoy some of the last days of summer at Beericana on Sept. 9 at Holly Springs&apos; Jefferson L. Sugg Farm at Bass Lake. The first-ever event was held in 2014 and boasted more than 2,700 people and samples from 58 different breweries. This year&apos;s festival is back and better than ever! Expect to find 70 breweries represented (including the majority of the 25+ Raleigh area breweries) and pal around with more than 4,000 beer enthusiasts as you sample delicious brews and listen to great tunes. Live music is one of the biggest highlights at Beericana. Raleigh&apos;s own Urban Soil takes the stage at noon. This local band weaves Americana, rock and soul into their explosive live shows and keeps the energy high. The Gypsy Swingers kick off at 2pm, featuring a wide array of jazz music mixed in with stand-up bass, clarinet, flute and sometimes violin. To close out the festival, The Trongone Band will take the stage at 4:15pm to entertain the crowd with a sound that falls perfectly between Southern rock and soul and Americana jam. During Beericana you can also enjoy tasty bites from some of the region&apos;s best food trucks, including American Meltdown, Baguettaboutit, Baozi Food Truck, Cousins Maine Lobster and more. Beericana not only offers great beer, food and music, but also, the "foam on top" is that a portion of the proceeds go to support the N.C. Craft Brewers Guild and other non-profits. To get even more excited about the festival, check out the recap video from last year! Beer with a cause? You bet! On Sept. 16, Bond Brothers Beer Company, voted the "Best New Brewery" in the country in USA TODAY&apos;s 10Best, will kick up the pace in downtown Cary with the Bond Brothers 5K. Registration opens at 9am with the race starting at 10am. Every runner and team participating in the Bond Brothers 5K will have the opportunity to raise money for the CAPCommunity Foundation, which is a volunteer-run organization that finds and vets requests to support grants that help children with physical disabilities, illnesses, abuse, poverty, the absence of a parent and more. Immediately following the race on Cedar St., there will be lots of celebrating, with an awards ceremony, block party, music, food trucks and plenty of beer! For more information and to register, visit the race website here. Not into running? You can still join in on the fun at the block party, and feel free to cheer on the runners for support during the race. With more than 40 one-of-a-kind cask ales confirmed, Big Boss Brewing Company&apos;s Casktoberfest is coming up on Oct. 5 when the brewery will be transformed into a giant beer hall with N.C.&apos;s largest selection of cask ales. (Cask ales are fresh, unfiltered and unique-flavor beers brewed and matured in the cask from which it&apos;s served!) There will also be several guest beers that&apos;ll be announced as they&apos;re confirmed. Sample and pay for beers as you go, and bring cash so the lines move faster. Try to arrive right when doors open at 5pm as this is a free-admission event, and you definitely want to have your pick of ales! Carpooling is highly recommended as parking can be tight in the warehouse area where Big Boss is located. R.S.V.P. at Big Boss Brewing Company&apos;s Facebook event page. And yes, dirndls and lederhosen are most definitely encouraged! Take the family for a fun event that supports a great cause and has excellent beer! The 4th Annual Triangle Oktoberfest takes place at Cary&apos;s Koka Booth Amphitheatre on Oct. 6 and 7. This year&apos;s Oktoberfest celebration will have live entertainment from the town of Apex&apos;s Peak City Sound and The Polka Brothers, traditional Bavarian food and fare and contests. Of course, authentic German beer can be enjoyed among the pines and overlooking the beautiful Symphony Lake adjacent to the venue. Triangle Oktoberfest is also designed to be the most family-friendly Oktoberfest event in the Raleigh area, welcoming kids of all ages with fun games and activities. The "Kinder Platz" Kids Zone is back and better than ever for 2017! This event supports local and regional beneficiaries, the Leukemia Lymphoma Society. Tip: Bring $5 in cash per car for general parking at Koka Booth. With nearly 30 breweries in the Raleigh area, you can bet that anniversary celebrations pop up quite a bit throughout the year! And in Sept., two of the area&apos;s favorite breweries toast to years on the beer scene. Join downtown Raleigh&apos;s Crank Arm Brewing for their 4th Anniversary Block Party, Sept. 16, noon-midnight. Local-favorite band Jack the Radio, plus other great artists rock Davie St., and you can chow down on food from Cousins Maine Lobster and The Bamboo Cookhouse food trucks. True to Crank Arm&apos;s love for bikes, a bike parade will go on around town. And one of the best parts? The brewery will roll out special archived beer from sours to barrel-aged rarities—lots of delicious stuff from the cellar will be on tap. White Street Brewing Company celebrates five years on Sept. 17, noon-6pm, in downtown Wake Forest with live music from talented local musicians Anthony & Mariah, Uriah Nash and Will McBride Group, food trucks and new beer releases (as well as some old favorites!). Definitely pick up a commemorative glass to mark the occasion but get there early, since there will be a limited supply! Check out even more upcoming beer events here! Also, keep an eye out for Raleigh Beer Week, Sept. 17-24, with event announcements coming soon!